NSW Department of Education Executive Director Frank Potter (Armidale Regional Council Mayor Simon Murray in alternate photo), left, Duval High School Principal Stafford Cameron, Northern Tablelands MP Adam Marshall, Armidale High School Principal Carolyn Lasker and Richard Crookes Constructions’ Ryan Sharp looking over the plans for the $117 million Armidale Secondary College today. CONSTRUCTION work will soon begin on the largest education project in the region’s history – the new state-of-the-art $117 million Armidale Secondary College, Member for Northern Tablelands Adam Marshall announced today. Mr Marshall also released the first-look of the new Armidale Secondary College, with a three-minute digital flythrough video, showing how students and staff will experience the new school when it opens on the first day of Term 1 in 2021. He made the announcement today at Armidale High School with local educators and Armidale Regional Council representatives. 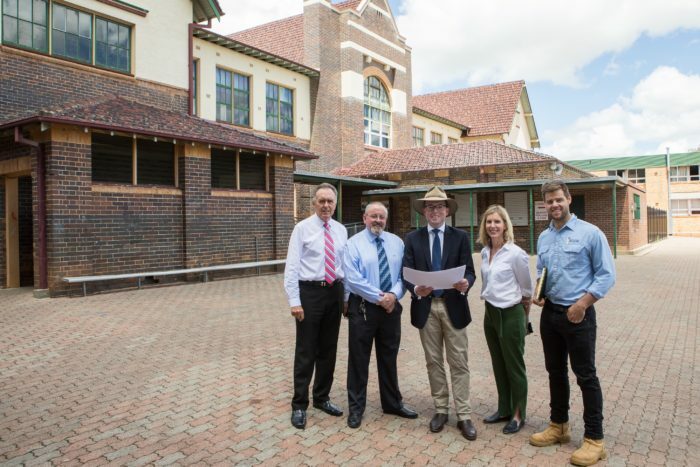 “Armidale Secondary College will usher in a new era for education in Armidale and country NSW, with the school featuring innovative technology and flexible learning spaces that can be adapted for different subjects,” Mr Marshall said. “It will be a school like no other ever seen before in country NSW and will completely change the way people look and think about education delivery in secondary schools, regardless of sector. Mr Marshall said there would be greater resources available for students and staff and more subject choices, especially for Stage 6 (Years 11 and 12) than had ever been offered by any school in Armidale or the entire region. The new campus, set to be built on the existing 18-hectare Armidale High School site, will cater for up to 1,500 students and deliver new school buildings with 79 new air-conditioned classrooms equipped with the latest technology, specialised spaces for industrial arts, hospitality and agricultural studies and improved performing arts and sports facilities. Mr Marshall also announced school will be home to a state-of-the-art ‘smart farm’ allowing students to learn from the latest agricultural technologies and methods in a purpose-designed indoor and outdoor learning area. The contract for the construction works has been awarded to Richard Crookes Constructions, which is currently undertaking the $60 million redevelopment of Inverell Hospital and has previously completed the $16 million Moree East Public School, as well as the redevelopment of Armidale Hospital. “The company has a proven track record in our region for delivering quality work and employing local tradies and contractors onsite,” Mr Marshall said. Mr Marshall said the new school will be a key part of the Armidale community and its educational future. “I look forward to seeing this outstanding project move forward, with students benefiting from a terrific new learning environment,” Mr Marshall said. Minister for Education Rob Stokes said the NSW Government was building on the state’s world-class education system so students are ready for the jobs of the future. “This project will deliver the students of Armidale the top-quality education resources they need to succeed,” Mr Stokes said. Information booths will also be set up from Term 1 next year, where the project team will be available to discuss the project and answer questions. This project is being delivered as part of the NSW Government’s record $6 billion school building program over the next four years, which is delivering more than 170 new and upgraded schools to support communities throughout NSW. This is the largest investment into public school infrastructure by any state government in Australian history. Designs are still being finalised on the new 425-seat performing arts centre, to be built on the school site.